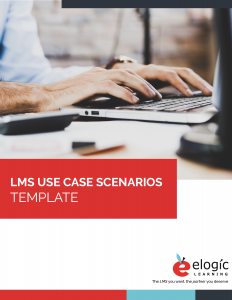 FREE DOWNLOAD: LMS Use Case Scenario Template. Easily create your own with this handy fill-in-the-blanks template after reading this article. When organizations are preparing to implement a Learning Management System (LMS), they need to ensure that appropriate diligence is conducted as part of their evaluation process. One tool that has established itself as a great way to assess the suitability of an LMS for a particular organization is the Use Case. “If I wanted to use the system to do xyz, how will I accomplish that”? The vendor should then be able to take that “Case” (e.g. : “How do I add new employees to my course roster”? ), and “Use” the system (e.g. : Click ‘Course Administration->Add Student-> Select the Course-> etc. etc) to demonstrate how to perform the desired task. When evaluating a system as vast as an LMS, it’s often easy for organizations to get carried away by lengthy features lists, comprehensive functionality descriptions, and great-looking screenshots. However, what you need to do is to evaluate the system in terms of its ability to cater to your particular organizational needs – and that’s where Use Cases come in. However, when you produce a Use Case to specifically demonstrate the LMS’s ability to report on an employee’s training history, for a staff member who has performed multiple roles throughout your organization; you may find the tool only tracks courses taken under a specific role or title – NOT by the employee’s overall tenure with the company (which is what you are interested in)! Therefore, Use Cases serve as an important tool to evaluate LMS’ functionality that caters to your company’s unique needs – and not what the tool may be capable of doing “generically” for the vendor’s other clients. Use Cases are also instrumental in helping LMS evaluators refine their own expectations around who (Training Manager, HR Department, Line/Functional Managers, and Employees) the system should support, and what type of support (Course Admin, Enrollment, Performance Tracking) it should provide. The Purpose should be very specific; as vague definitions can defeat the purpose of the Use Case. Also, Critical to note items, such as whether the system authenticates authorized users before giving them permission to perform the function, will enhance the Use Case’s value in the evaluation process. While Use Case 201 focused on a specific way to use a particular functionality, Use Case 202 seeks to verify if the LMS can integrate a number of “WHATs” the way your company typically performs them. Obviously, depending on how deep you wish to go with them, something as complex as an LMS system will span a large number of Use Cases – potentially in the hundreds! But if you do manage to produce that many, they will no longer serve you effectively in evaluating the LMS. In fact, too many Use Cases could be a distraction to the evaluation process. Focus on the core needs: Prioritize what your users will need the most, such as Course Creation, Scheduling Courses, Enrollments, Launching Courses, Tracking Performance, Managing Content, Reporting, Assessments. Then, produce Use Cases to address those needs. Keep it simple: Even within a core need, you should avoid the temptation to create overly complex Use Cases. For instance, if “Training Approval” is a core need, instead of producing one large, complex Use Case to cover every approval scenario, build multiple, simple scenarios, such as “Use Case 3A – Approving New Employees”; “Use Case 3B – Approving Existing Employees”; “Use Case 3C – Approving Contract Staff”…etc.Approaching Use Cases this way will ensure that the nuances involved in each sub-function are adequately demonstrated (e.g. approving Contracted staff may need a different set of validations than Existing employees) by the LMS being evaluated. In a multi-solution evaluation scenario, where all LMS tools are being considered offer equivalent Use Case compliance, such metrics may give you a better view into which is the most appropriate solution for your organization. In parting, one important thing to know about developing and using Use Cases is that, ideally, they should be developed in collaboration with each of the roles that the LMS will support. Additionally, it is also important to remember that the ideal use case will aid, NOT OBSTRUCT, the LMS vendor in demonstrating his/her tool’s ability to comply with the Use Case. They should therefore be written as such. Want this information in a downloadable and easy-to-use template? Ask and you shall receive! This template gives you a place to input your own business’s LMS use case needs including the WHO and WHAT along with specific purposes and flows. We’ve also included an example to make things easier.